Formative 2/ FA 2 Maths CCE Model Question Papers and Project works for 6th, 7th, 8th, 9th, 10th Class 2018-2019 Academic Year Prepared By Our Maths Subject Expert Teachers. Download FA-II Maths Question Papers, Model Project Works VI to X Class Maths Subject AP and Telangana. Formative II Mathematics 6th/ 7th/ 8th/ 9th/ 10th Class Slip Test/ CCE Model Question Papers. Formative Assessment 2 Maths Model Papers for English Medium(EM) and Telugu Medium(TM) for X Class Mathematics, MM, Maths Formative –II Question Papers, Download FA2 Question Papers for VI to X Classes Mathematics, MM, Maths. AP FA 2 Question Papers Mathematics, MM, Maths, FA2 August - Classes 6 to 10 Prepared By P V Ramesh SA (Maths) ZPHS, Urandur, Srikalahasti. Formative 1 SSC Maths Model Slip Test/ Question Paper 2018 for 8th, 9th, 10th Class CCE FA2 Mathematics Project Works SSC FA 2 MathsTelugu/ English Medium Slip Test Model Question Papers 8th FA2 Maths Question Papers 9th Class FA 2 Maths Formative Assessment 2 Slip Test Download 10th Class Formative Assessment Question Papers PDF FA 2 Maths Free Download Formative Assessment Sample Question Papers Formative Assessment Model Question Paper Download. CCE FA II / Formative Assessment Model Question Papers for Maths from Class VI to X Class Download Maths FA 2 Model Question papers Continuous Comprehensive Evaluation Useful Maths Model Slip Test Question Papers and Project works for Formative Assessment II in Andhra Pradesh, Telangana. 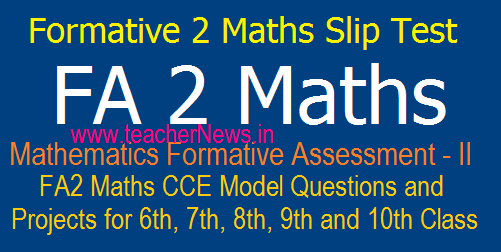 Printed Maths Question Papers for FA 2 Download Free PDF Here Formative Assessment should be recorded in the Month of August every year for All Classes from 6th to 10th. Formative 2 ( FA 2) CCE Question Papers for 6th/ 7th/ 8th Class Maths, PS, Telugu, Hindi, English, Science, Social Slip Test question paper, Upper Primary UP 6th, 7th, 8th Classes FA 2 question Papers 2018-19 EM TM formative Assessment 2 Model Projects 6th Class, 7th Class, 8th Class Telugu, Hindi, English, Mathematics, Physical Science (PS), Biology, Social Subjects Question Papers Download. FA 2 Maths CCE Model Question Papers/ Slip test and Project works for 10th, 9th, 8th, 7th, 6th Class Telugu/ English Medium, SSC Formative 2 Maths Question Papers.